Our goal is to cycle nutrients as best as possible on our property. We aren’t perfect but we work very hard to cycle nutrients better through our system. Originally we called our eggs Daily Up-cycled Eggs because we were getting all the chop from the local Co-op called Daily Grocery and we were primarily feeding the birds this chop and allowing them to forage in the woods. Now our flock has grown and we have increased the number of businesses we collect chop from to continue to support the healthy diet for our birds. We also supplement with GMO free/hormone free chicken feed, fermented scratch grains and apple cider vinegar in their water. We feed the chop to the chickens in what we call the compost run where they devour what they want and leave the rest to compost in a deep bed of wood shavings we get from a local furniture builder. We also keep a black soldier fly larvae bin during the warm months and feed them everything the chickens don’t want, or shouldn’t have too much of, like breads and citrus and onions. These larvae devour EVERYTHING and turn it into small protein packets in the form of themselves: larvae, which we then scoop out and feed to the chickens! It is truly a wriggly delight for the gals. We put the scratching tendencies of the chickens to good use and they do a lot of the heavy lifting in the compost run. Their natural need to scratch is an effective way to turn the deep bedding and bury the chop they chose not to eat. We do, however, periodically turn the compost run to keep it aerated and move fresh material deeper into the wood chips to further decompose. This process greatly reduces smell, as it better combines the hot litter and fresh leftover chop with the wood chips, and through the process of decomposition, makes really beautiful compost. Our compost is not an exact science presently so we are trialing it on our gardens but maybe in the future we will be able to share it with customers. We also wild forage chanterelle, oyster, lions main and hen of the woods mushrooms. We plan to add more mushroom cultivation to our business soon. We also make the most of other wild edible flushes as the season allows. The Chicken Barn was recently completed and now the gals have a larger, safe space to sleep, eat and get out of the rain, as well as a safe outdoor enclosure (the compost run) where they can spread out, eat, scratch and sun themselves. 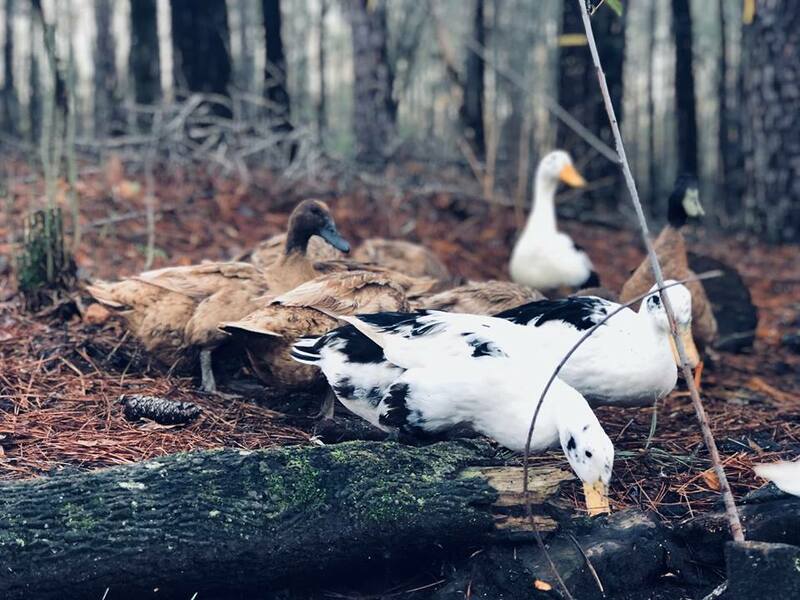 We allow the gals to rotate through runs in the woods and we use their insatiable apatite for green plants, to help keep the muscadine and tree stump sprouts at bay. This fall they will be helping to keep the future veggie garden from growing up in muscadine, black cherry, oak and sweetgum as well as taking care of the brier, dog fennel and other opportunistic weeds that we don’t welcome in the garden proper. Milking goats...? for continued forest understory maintenance and goat cheese!